Political cartoonist Carlos Latuf regularly compares Israel to Nazis, but that didn't stop Channel 2's Arad Nir from recommending his work. Arad Nir, Channel 2 News’ foreign affairs editor, on Tuesday recommended to his followers on Twitter that they follow anti-Israel political cartoonist Carlos Latuff. Nir described Latuff’s caricatures as "sharp" and pointed out that Latuff, "as usual, does not spare anyone." But for some reason he ignored the anti-Semitic tone in Latuff’s caricatures and the fact that he often compares between Israel and the Nazis in his caricatures. Latuff won the annual Iran holocaust denial contest in 2006 due to the anti-Israel character of his drawings. In 2012, it was revealed that Latuff used his artistic abilities to benefit “Occupy AIPAC”, an organization that seeks to de-legitimize Israel and its supporters. “It is amusing to remember that Arad Nir, who grovels before a blatant and extreme anti-Semite, recently accused [President Donald] Trump of surrounding himself with anti-Semites. Channel 2 News viewers should know who presents them with information and who his heroes are," added Amiur. Nir’s Twitter recommendation did not go unnoticed by Internal Security Minister Gilad Erdan (Likud), who responded with a sharply worded post on Facebook. "Sometimes I am asked why I criticize Arad Nir, and I think he provides the answer himself every now and then, like today, when he praises an exhibition of caricatures by an anti-Semitic cartoonist who compares Israel to the Nazis in various ways. A man who won an Iranian Holocaust denial cartoon competition in 2006. ‘Thank you Arad,’ the anti-Semitic cartoonist replies to his warm recommendation. ‘So precise, so sharp, so sad!’ Arad Nir replies,” wrote Erdan. “This is the same Arad Nir who attacked U.S. President Donald Trump for being surrounded by anti-Semites. How far can the hypocrisy go? Look at the shocking caricature I attached, which is just one example of the horrors created by Arad Nir’s favorite cartoonist, and how the same cartoonist compares IDF soldiers to Nazis who murder children in Lebanon. 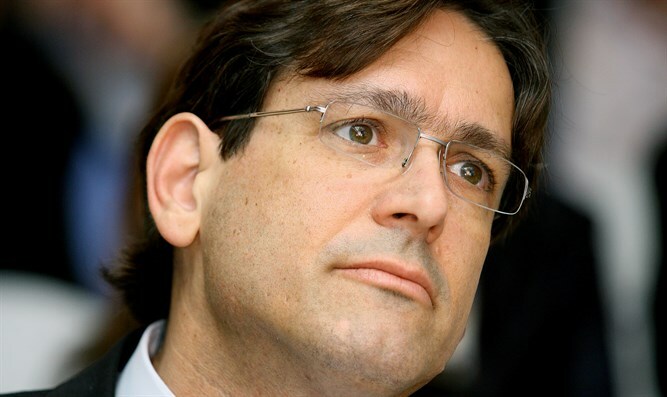 Arad Nir is the foreign news editor of the most watched newscast in Israel. So why do I criticize him? Because sometimes, silence is slime,” added Erdan.